Nowdays computers are connected between each other. From the small area such as your home Local Area Network (LAN) until the the biggest one which we call - Internet. When you are managing a network computer, you are managing one of the most critical component. Since most of developed application is web based application, the network between critical. Now after 15 years, you will find ntopng - the next generation ntop. Ntopng is a high-speed web-based traffic analysis and flow collection. Ntopng is based from ntop. It’s run on every Unix platform, MacOS X and Windows. 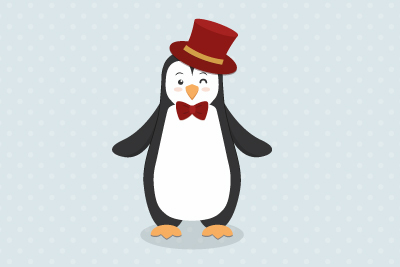 Ntop is available in pre-compiled packages for CentOS dan Ubuntu 64-bit based. You may find the packages in their download page. For 32-bit operating system, you have to compile it from the source. This article is tested on CentOS 6.4 32-bit version. But it may works also in other version of CentOS / RedHat based Linux. Let’s start. If everything is installed, then it’s time for us to running it. By default, redis and ntopng will installed in /usr/local/ folder if we don’t change the installation folder explicitly in ./configure step. Next we need to create configuration files for ntopng. In this article we use vi as text editor. You can use your favorite text editor to create ntopng configuration files. 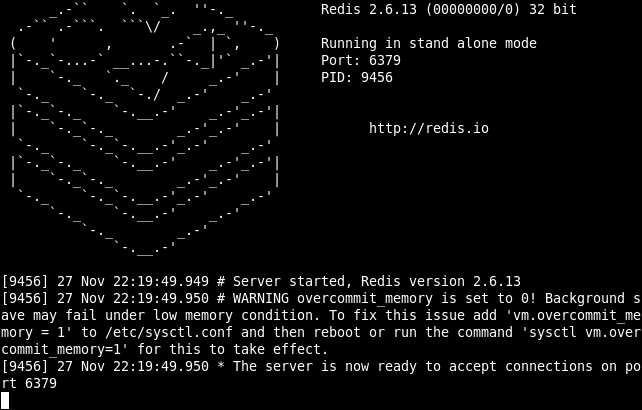 We assume that you have installed web server correctly, then the next step is to run redis server. 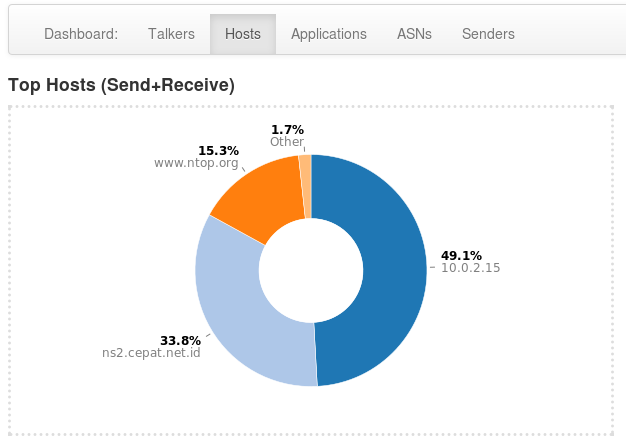 Now you can test your ntopng application by typing http://yourserver.name:3000 . You will see ntopng login page. For the first time, you can use user ‘admin’ and password ‘admin’. The dashboard is quite simple. 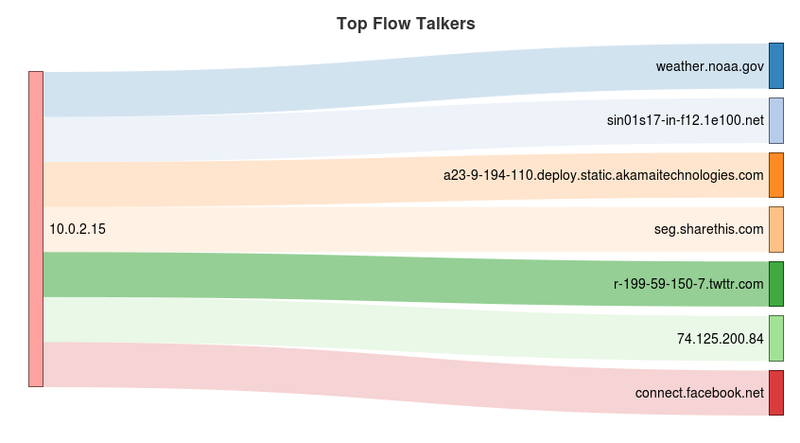 After you logged in, you will see an information about Top Flow Talkers. 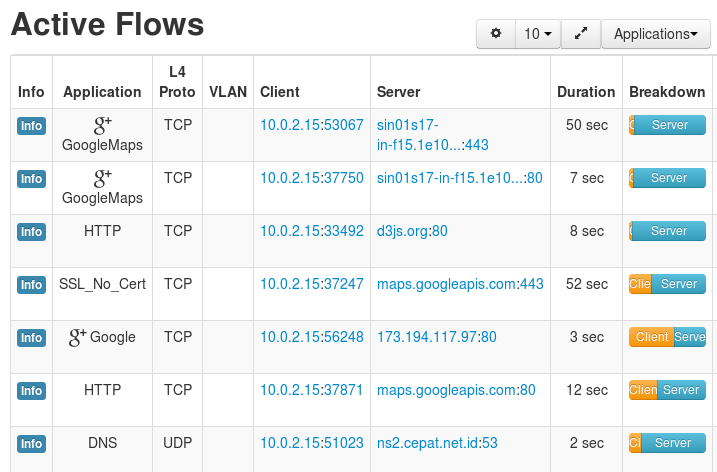 If you click Flows menu on the right top, ntopng will show you more detail about Active Flows. 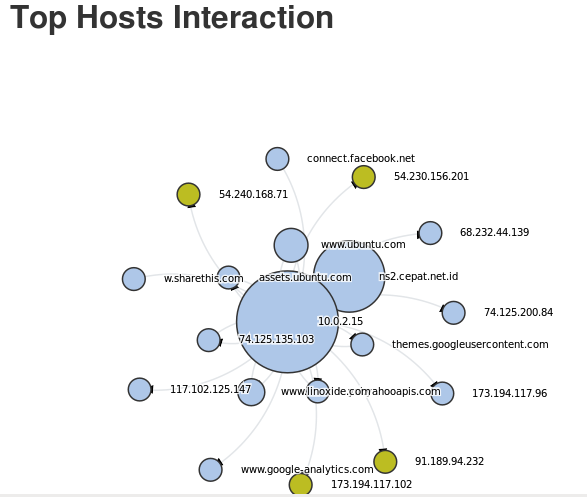 If you click Hosts > Interactions, ntop will show you a nice graphic about interaction which happen between them. Interfaces menu will bring you more menus inside. Packets menu shows you size distribution of packets. 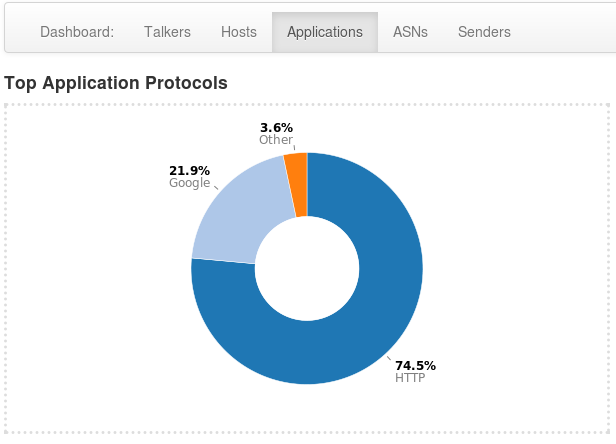 Protocols menus will give you information about how many protocols that have been used and its percentage. Last but not least, you can also manage the user who can access ntopng via Settings menu on the top right area (the one that have a gear icon). Then click Manage Users. Ntopng provide you with a wide range of timeframe, from every 5 minutes until 1 year. You just need to click the timeframe you want to show. The graphic itself is clickable. You can click it to zoom it. Of course, ntopng is more than just pictures above. 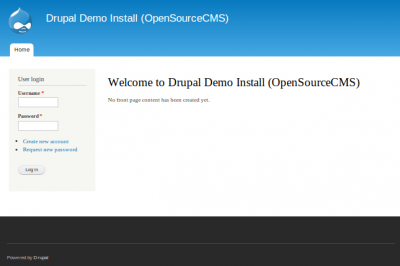 You can also integrates it with GeoLocation and GeoMap services. From ntopng website it self, there are a paid modul such as nprobe to enrich the information provided by ntopng. 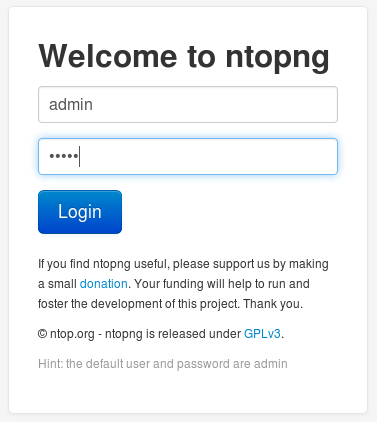 For more detail usage of ntopng, please visit ntopng website. It was an absolutely new tool to monitor the system. Thank you for the detailed description of its installation. 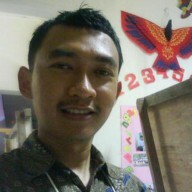 I will consider it and try to compare with my tool Anturis. We are glad if this article can help you. May I know the admin menu you mean? 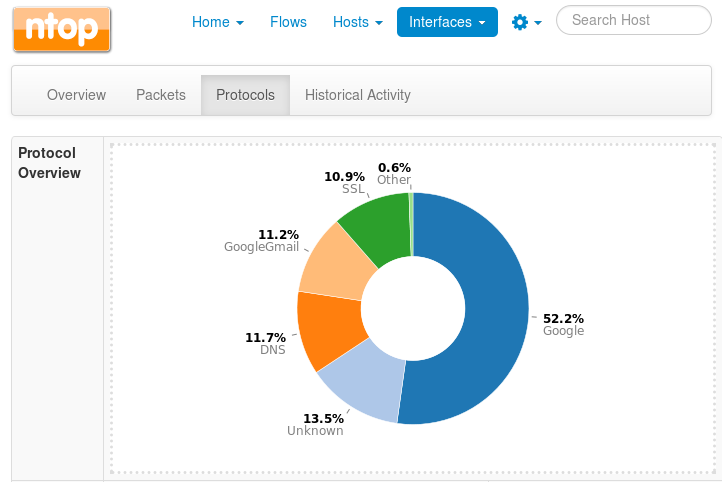 On my ntopng server, when I logged in as admin, I have Home, Flows, Hosts and Interfaces menu at the top right area. I'v already setup the ntopng on my Ubuntu 12.04 LTS machine, i just want to ask what will be the setup for the ISP (Public IP address) ? Also, how to setup ntopng to show VLANs Bandwidth usage? To monitor public IP Address, you can fill this line --local-network “your_public_ip_address” on your ntopng.start file. Ntopng will see it as your local network. About VLAN traffic, I have not tested yet but ntopng has -m option. With this option, you can list your VLAN networks, and ntopng should treat them as local networks. I hope this help. Here's my scenario, I have Zentyal UTM for Network Infrastructure Management, I created Multiple VLANs, I have 2 ISP and also I have a Cisco switch for the distribution of different VLANs. My ntopng is setup on VMware and connected to one of my VLANs. My question is how to monitor my 2 ISP? is it possible to monitor the 2 ISP (Public IP address)? Also, where do you setup your ntopng? is it setup after your ISP ? Is it possible to integrate ntopng on Zentyal ? it will monitor all the Bandwidth usage ? Sorry for the questions. I'd really appreciate your help! 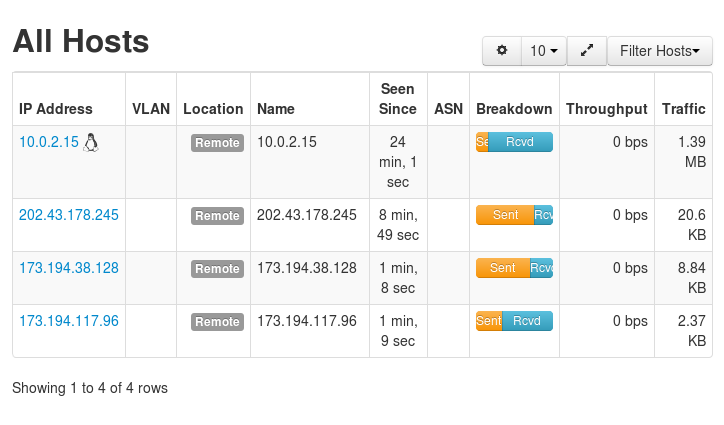 Ntopng can monitor more than 1 IP address. 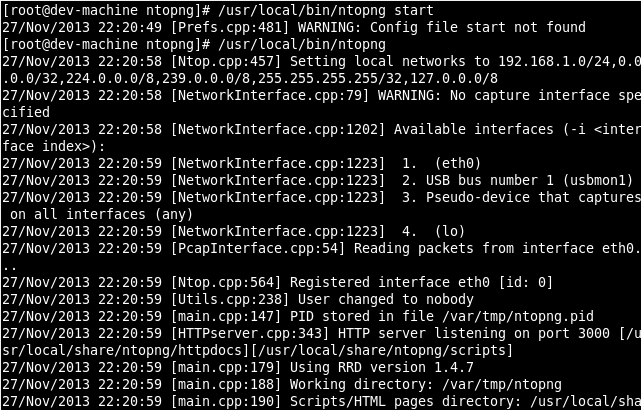 On ntopng.start file, we can put the local-network parameter more than 1. Also put the interfaces. 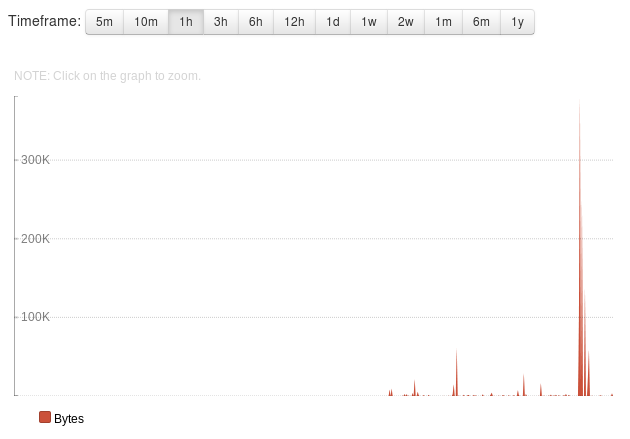 The number of interfaces comes from your available eth on your server, where ntopng is installed. Yes, I setup ntopng after my ISP. I have never use Zentyal before, but I believe that we can integrate ntopng with Zentyal Linux. 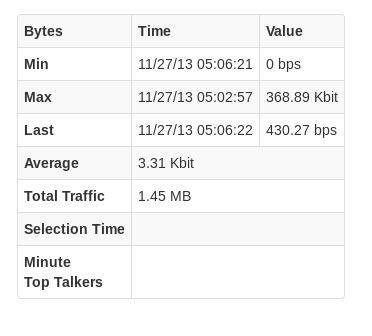 I don't think ntopng will monitor bandwidth usage. 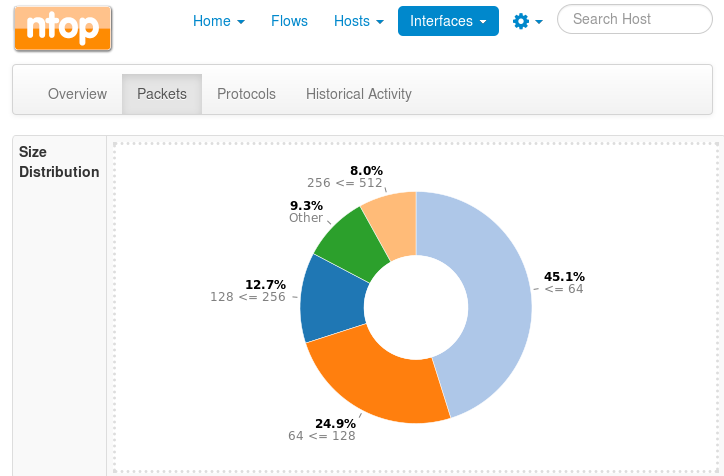 Ntopng is a network monitoring analysis. So I think I won't get result like MRTG or Bandwidthd. Why the "make" command is not working ? I'v already install the libpcap(-dev). May I know what Linux do you use? When I run the NTopng I get these errors. http://www.nmon.net/centos/6/i386/repodata/repomd.xml: [Errno 14] PYCURL ERROR 22 - "The requested URL returned error: 404 Not Found"
Please help to install ntopng using RPM. Just wondering if you managed to solve the problem, I am experiencing the same issue. Please update who is successful using the yum repo .